Are you Raising Kids with Commitment Issues? 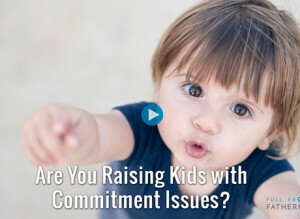 Home » Dad » Are you Raising Kids with Commitment Issues? Ever wonder why so many men are afraid of commitment or so many women are afraid of abandonment? All too often it is because we are unknowingly using our kids to meet our own needs. I can’t tell you how many really emotionally intelligent parents I see significantly impacting their children’s ability to navigate relationships. The reality is that we all do it, but the more aware we are of the potential, the more we can protect our children’s opportunities for having really healthy relationships throughout their lives. Watch more at Full Frontal Fatherhood. There is an important shadow aspect to being a parent that is overlooked and quite problematic. All too often we use our kids for our own emotional needs and this has a significant negative impact upon them throughout their lives, especially upon their ability to be in relationships later in life. Those subtle messages of, “You can’t go away, I need you,” are actually quite impactful for a kid. They get torn because they do love us and they want to give us affection, but they also want to go play. Depending on how much emotional pressure is behind our words, they will feel bad internally. In attempt to make us happy and thus their world safe, they will unconsciously move towards us and become our ‘good little partner’. This is one of the reasons that a lot of men and many women have commitment issues. They are often scared to be close to anyone because they are worried that they won’t be able to maintain their sense of individuality and thus ability to meet their own needs. They learned from a very young age that to be close with another is to have to take care of the other’s emotional needs over one’s own. We need to watch ourselves. Are we giving from a place of open heartedness without strings or are we holding them when they want to run off and play? When they do not want to interact with us, do we allow them space by sitting back and being emotionally available without resentment when they return to us? Or are we pulling on them, with our words: “No, stay here,” and subtly guilt tripping them: “Hey, where are you going? Don’t you want to play with me?” Notice your tone as even the nicest of words can communicate your neediness when said with the wrong inflection. Notice if you are getting your needs met and see if you can turn towards your partners, your friend or yourself instead. Perhaps their are wounds with your partner or in yourself that need addressing in order to be able to bond with them and take the pressure off your kids. Do what it takes to heal these wounds, whether it is self-reflection, the help of a really good friend or a therapist. It is deeply satisfying to kids to see their parents getting their needs met from one another. Not that they won’t protest losing your attention and attempt to get between you in some moments. By removing this responsibility from your child, they can move forward in life and have relationships that are free from the fears that so many people have in relationships. Kids need a huge amount of love and there is no such thing of spoiling them with too much love, but if we are attempting to get our own needs met through them, it can be really detrimental. Do what you can to give them that love that they need and get your love that you need from somewhere else. Thank you for joining me for another episode of Full Frontal Fatherhood. I would love to hear your ideas. If you feel bold enough please share it in the conversation below, let’s be friendly because we are all just doing our best. I’ll see you next time for another episode of Full Frontal Fatherhood.